Will Jean Louis ever find me indispensable? On Saturday, October 20, 2012, my friends and I attended the inaugural Halloween Spectacular at Salt Lake City’s Caterina, the current culinary venture of my not-so-secret French crush, Jean Louis. I had vowed to make myself indispensable to him in my New Year’s resolutions. Ten months later, I found the courage to make the first move. We set off to Caterina so I could proposition Jean Louis about collaborating on a cookbook or memoir. My friends and I hired a driver to deliver us from our hotel room to the restaurant. Our driver seemed annoyed about his line of work. “You’re going where?” he asked, swerving in and out of lanes and fiddling with his GPS unit as we slid from one side of the backseat to the other. “That is much farther than I thought,” he said, glaring back at us without slowing down. (The restaurant was about 40 blocks away.) Our driver drove like multiple warrants had just been issued for his arrest, and he almost murdered two pedestrians who happened to be crossing an intersection at a red light. He shook his fist at them and screamed, “Go on, then! You are already dead!” We chose to ignore this dark omen, tipping the driver to silence him and leaping from the still-moving vehicle once we arrived. 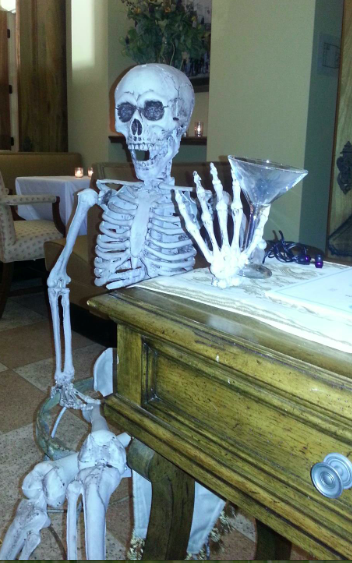 A skeleton wielding a cocktail glass greeted us in the lobby, as did a dapper courtesan in a vest and beribboned patent shoes. The courtesan introduced himself as Martin Skupinski, and waved us into the spacious dining room, where more skeletons sat in various poses, their legs crossed and jaws dropped in toothy, lascivious grins. Spider webs enshrouded the large chandelier and the room’s high windows. Several of the other diners wore costumes or masquerade masks. Pirates, gypsies, and zombies milled about as the wait staff cleared a space in the center of the wooden floor. Cindy, a seasoned (and likely professional) dancer clad in a red tango gown, placed my left hand on her shoulder and her right hand on my waist, grasped my other hand in hers, and proceeded to box step her way right over my heart. Her heavily kohled eyes caught every misstep. Skeleton feet prodded my rear end as she dragged me through the motions. After three dances and at least one hundred iterations of “You walk the circle, you pause at three” and “Lower your arm to here,” Cindy dumped me on the dance floor, leaving me with nothing but a scornful assessment of my fox trotting abilities. Freed from our bad romance, I seated myself at the table and tossed back an entire glass of wine in three deep gulps. Then I drank another, whereupon I decided that it was high time to find mon cher, Jean Louis. Busy with preparations and management of his wait staff, he greeted me in the lobby, though not as warmly as I had hoped. I last saw Jean Louis about a year ago at his Park City restaurant, Jean Louis. The reception he gave me then would have tempted even the saintliest of women to abandon their husbands and abscond with him to his native Normandy. My heart fell this time around. His blue eyes didn’t twinkle in my direction. He did not compliment my perfume, dimples, or sparkly eyes. My words evaporated. No propositions were made. I returned to the table and tried not to cry into my butternut squash soup. I once knew someone who asserted that food quality corresponds directly to the cook’s mood. I agree. I also think a chef’s mood affects the dining experience, particularly when the chef prides himself on how he welcomes his customers. Jean Louis worried me. Denim jeans hung loosely against his legs. His eyes darted across the dance floor to assistants and the wait staff, transmitting instructions, prompting them to action. He stalked between the serving station and the kitchen like a caged lion, carrying out tray after tray of food for each course of the night’s meals with the help of his staff. He served the entire buffet alongside them. I’d planned poorly, impetuously. I was foolish. It’s bad form to spring a proposition on an unsuspecting chef. I’m sure there were many factors and circumstances beyond the glamour and glitz of the dining room. I would have liked to ask Jean Louis about them. Productions of spectacular proportion require exhaustive planning and preparation. A chef of Jean Louis’ reputation – he’s worked in a kitchen since he was twelve and has a distinguished professional pedigree – finds a way to pull it off without breaking the illusion of fluidity and ease. I worried anyway. The smile I’d hoped to see made far too few appearances that night. Dazzling Martin tried valiantly to resuscitate my self-esteem during the dessert course. With a mischievous smile, Martin twirled me around the dance floor, amiably bantering, for two pleasant minutes, and he, at least, dumped me with a flourish and a bow. I was very grateful for his kindness. Sadly, the internal wounds I had sustained earlier in the evening were too deep to overcome. Our driver’s prophecy proved true. Brutalized, beaten, and emotionally shanked, my self-esteem died shortly prior to midnight. My crush on Jean Louis lingers, but it has been tempered by a splash of icy cream in the hot soup of my heart. It will probably be another year until my friends and I save enough money to return to Caterina, but when we do, I hope that we’ll see a Jean Louis who smiles again. Caterina is located at 2155 South Highland Drive in Salt Lake City, Utah. Private dining menus range from $35 – $65. The restaurant can be reached by phone at 1.801. 819. 7555 or found online at http://www.caterinaslc.com. Though I was too distraught to register the quality of the prepared meals, my friends said they were very delicious. They went back for seconds in many of the courses. 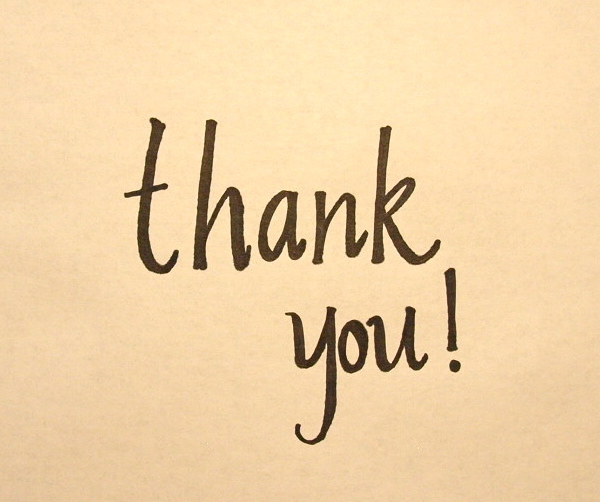 Our waiters were courteous, and they provided meticulous service. The $55 prix fixe menu, however, did not include water, for which they charged $8 per bottle. This seemed a bit excessive given that we were essentially serving our own food. The restaurant’s décor was spirited and a little saucy – perfectly apropos to Halloween. 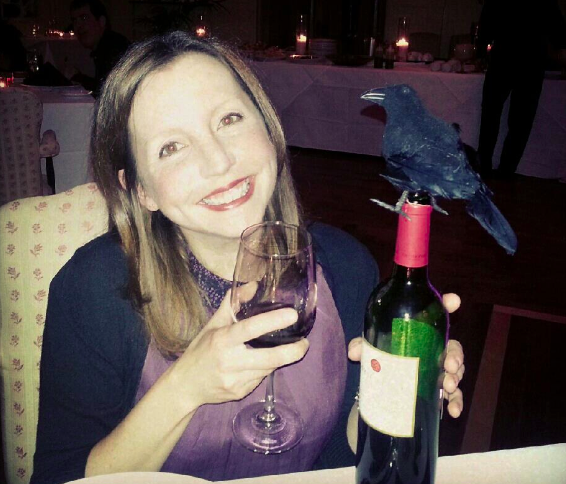 My friends and I had a lot of fun taking pictures of skeletons, bottles of wine, and raven figurines. I plan to return to Caterina on an ordinary night, perhaps one more auspicious for the making of propositions.